Join us aboard the elegant Danish schooner Donna Wood on this 8 day adventurous photography expedition to the rugged land and calm seas of Scoresby Sound in east Greenland. We will visit and photograph majestic, other-worldly scenery while enjoying the comfort of this finely-crafted sailing vessel. 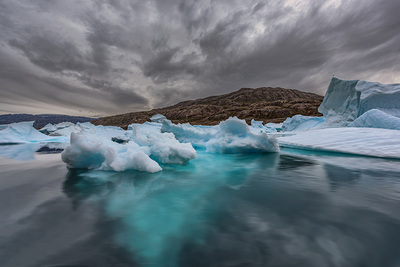 Greenland is the world's largest island, located between the Arctic and Atlantic Oceans. 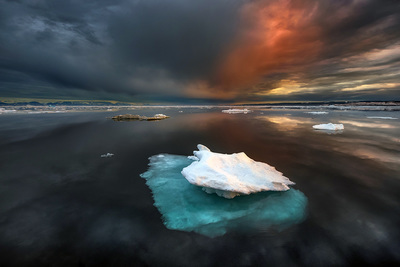 Eighty-five percent of the land mass is covered with ice. Summer is the season of the midnight sun and a great time to experience Greenland on both land and water. Whales swim along the shores, icebergs flow from calving glaciers while flowers and arctic plants abound. The climate is generally mild through the summer season. 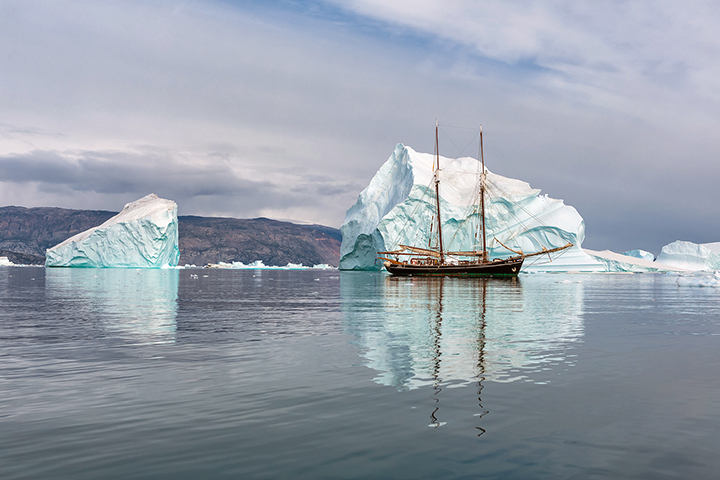 There are very few roads between towns and communities in Greenland so our expedition will be aboard the sturdy Donna Wood, which will allow us to explore the magnificent scenery in Scoresby Sound fjord and to go on ashore with zodiac boats. 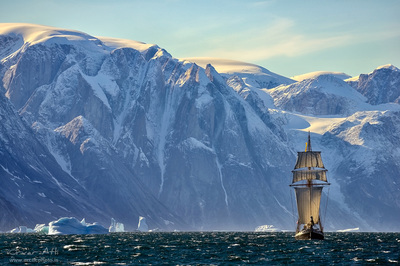 The Scoresby Sound on the eastern coast of Greenland has a tree-like structure that branches into a system of numerous inlets, making it the largest fjord complex in the world. They extend up to 350 kilometers inland and offer spectacular scenery with tranquil surroundings and wild, craggy coastlines. There are endless opportunities for photography with steep granite mountains and white icebergs floating by and reflecting in the calm blue water We will also see large glaciers, abundant wildlife, and remote villages where local people live as they have for centuries. 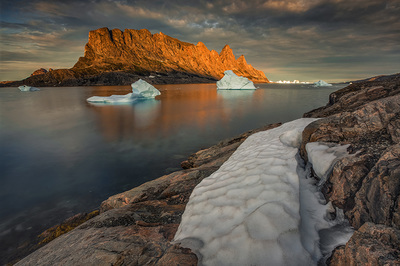 Greenland offers an unspoiled and rarely visited setting. Plan on a once in a lifetime experience with unique and compelling images. You will land at Keflavik international airport and transfer to your hotel in central Reykjavík using the quick and efficient FlyBus. We’ll meet at 7 PM in the lobby and go out for dinner, which will include an orientation. Overnight in Reykjavik. We will begin our journey by departing Reykjavik and arriving 2 hours later at Constable Point airport. There we will enter our sturdy expedition schooner and get all necessary information about safety for our remarkable journey ahead. We will sail to the town of Ittoqqortoormiit, a remote village which is quite unlike any other community. It has a population of around 470 is as remote as it can be from any other inhabited area in Greenland. It’s a hunter's society where hunting and fishing are the sole sources of survival for the community. The brightly painted wooden houses create a unique scene and backdrop for photography as one wonders how it is even possible to survive in such a remote rugged area where the sea is frozen over for nine months of the year. Greenland is known for its impressive display of icebergs. They vary more in form and color than anywhere else in the world allowing for stunning scenery and photographs. Today we will sail west through Scoresby Sound between colossal ice blocks, experiencing and photographing this wonder-filled world. You will be awed and humbled by the floating ice sculptures as we pass through the fjords. 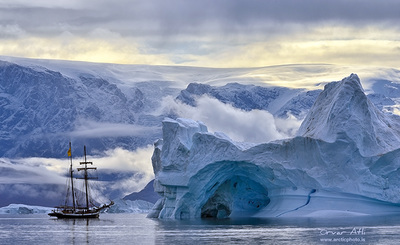 Rødefjord , situated in the inner Scoresby Sound, is often filled with these towering icebergs covered with an icy crust. You will not only be able to photograph this amazing sight but also be able to listen to the sound of the cracking and rumbling ice as it seems to express its feelings. We will anchor in an old Inuit settlement area, Hekla Havn, where we will have the opportunity to explore and capture the beautiful surrounding area on foot. Today you will see Føhnfjord, a narrow fjord, which hosts majestic mountains and cliffs with jaw-dropping basalt mountains and steep 6,000 foot high granite cliffs on Greenland´s third largest island--Milne Land. We will sail through the colorful Hare Fjord and onto Rødefjord, with large icebergs floating next to us. Moving the boat around will give us different compositions and different ways of seeing aspects and details of the subjects. The scenery is spectacular, with towering mountains and hundreds of large icebergs playing tricks with your sense of perception. 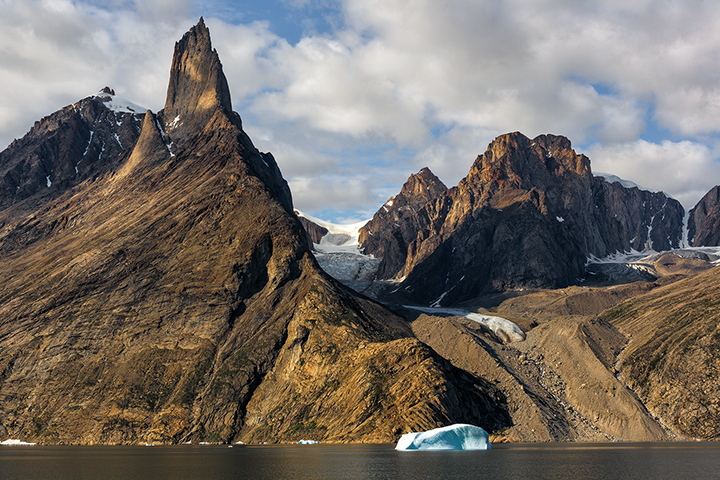 We will stay in Hare fjord for two nights to take advantage of the amazing scenery. We will spend the day in Harefjord looking out for wildlife while enjoying the breathtaking scenery. Mountain ridges, glacial outlets and tongues are characteristic of this area and the land animals consist of muskox, arctic fox, stoat, mountain hare and eagles. A bonfire and BBQ will be most welcome at the end of the day. Today our focus points will be the grand mountain peaks and summits while sailing through Øfjord. Granite walls of 200 meters rise from the sea will be in front of our eyes and cameras. The land surrounding the fjord is mountainous with dramatic steep ridges. We will end our day setting anchor in Jyttes Havn at Bjørneøe, an area that is very barren with endless rocks plains and lakes. However the coast at Bjørneøe is quite spectacular, with vertical cliffs and caves offering very picturesque scenery. We will spend this day in Bjørneøe or Bear Island, which offers beautiful scenery and photo opportunities. The island was declared a nature reserve few years ago and is protected from development. The landscape is unique with gentle slopes, steep coastal cliffs and sea stacks just offshore. This island is home to some of the largest seabirds colonies in the North-Atlantic and the polar bear, who gave the island its name, only pays only occasional visits to the island when it´s surrounded by drift ice during the winter. We will end this beautiful day by dining on the beach while enjoying the setting sun. Today´s expedition will be a cruise through the spectacular archipelago between Bear Island and Milne land, which is often called the Arctic Riviera. 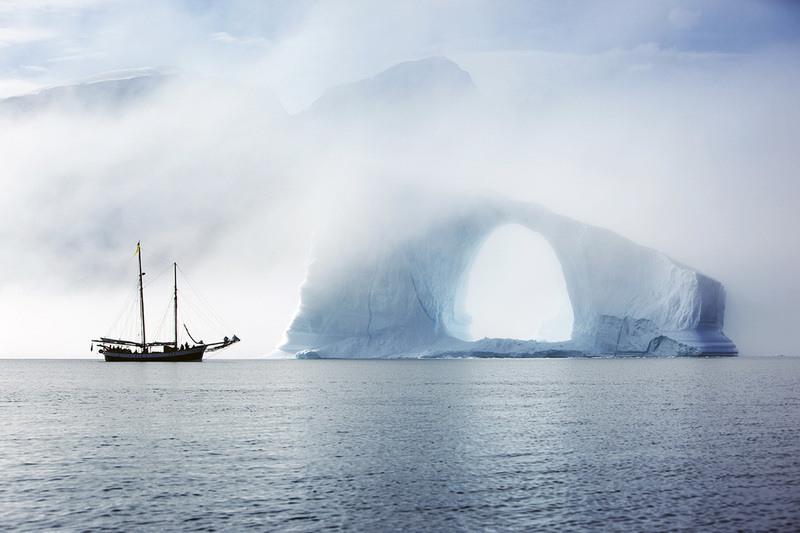 While sailing this channel you will be able to see and capture the largest and most fascinating icebergs of the journey--giant ice blocks tower over us along the fjords. When we wake up next morning we will anchored at the airstrip in Constable Point. Today we will relax and enjoy our last moments in Greenland by having a hearty breakfast with the group while reminiscing about the experiences we sharted on our journey. After breakfast we leave the schooner and connect with a flight back to Reykjavik for the night. Accommodation in made up bunk/beds with shared facilities . Soft drinks, services of the crew, hiking excursions (as per itinerary). Alcoholic beverages (available for extra charge & to be paid upon departure in cash). The price for this tour is $6950.00 per person, double occupancy. Please add $650 for single occupancy. ship. 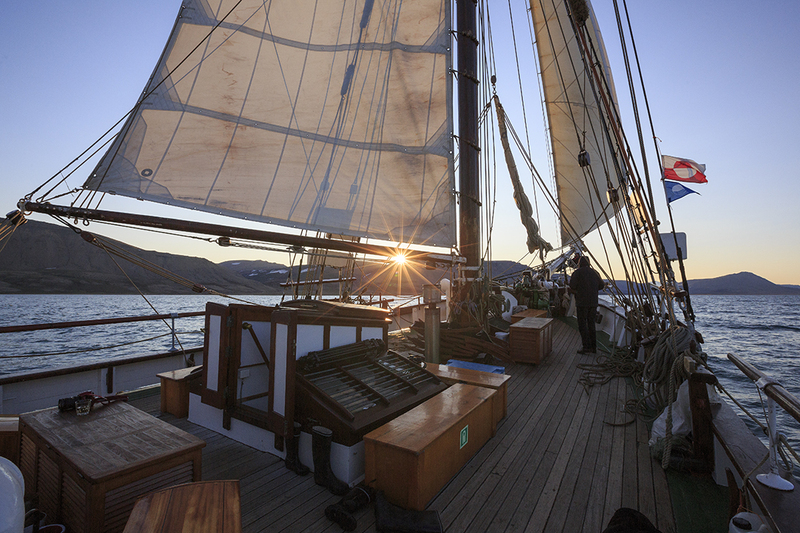 In 1990 she underwent massive restoration and was equipped with rigging and sails. Donna Wood is a roomy ship with a deck saloon seating 24 and ample space below deck. She can comfortably accommodating 12 people in 7 cabins equipped with washbasins and closets. The hallway features spacious shared shower facilities and toilets.